This is an awesome piece. It looks great and would be a great display piece,however, I am hesitant to buy it for my collection though for several reasons. If anyone else has any more information on this or other pieces from the commercial please let me know!!!! 1. Someone told me that they knew of another one in existance. 2. There is another identical head to this exact Mike on Ebay. Makes me worried that multiple may have been sculpted which, while still awesome in appearance, makes it less exciting and collectible and while I collect because I have a passion for the pieces, I can't justify $1600 for something that may not be what I think it is. 3. 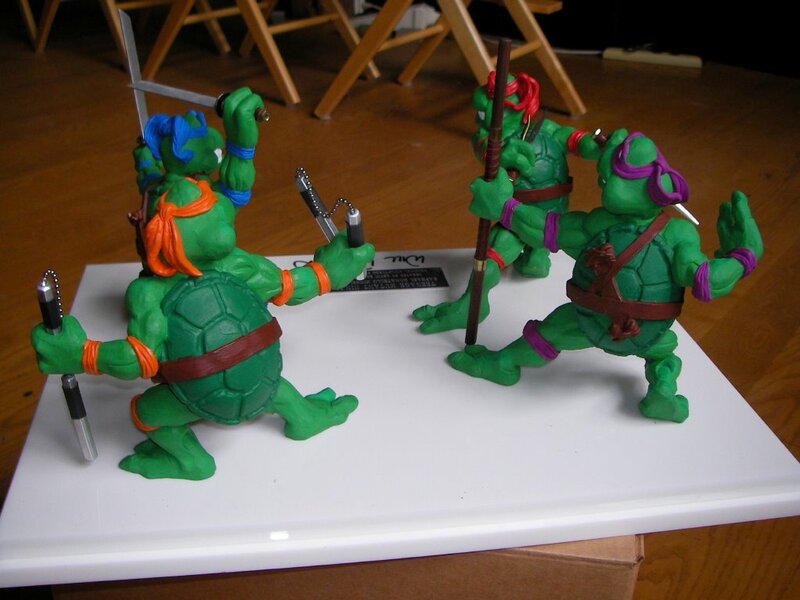 I have contacted the company that produced the commercial with this figure, and am trying to track down the producers to find out A. if this is genuine and B. where the other turtles are. I am the type that like to have all 4 turtles for sets. From what I know there are more than one. and then there's the one from eBay. Oh wow! That whole set looks freaking phenomonal! the colors are are perfect! To me that would be worth the money no doubt!!!! But I appreciate the pictures and information, it just goes to add to my suspicions that there are multiple molds and castings floating around and because of that, I would think that $1600 is just way more than I would want to invest in a single piece. ANy ideas how much the set of 4 sold for and when it was bought? 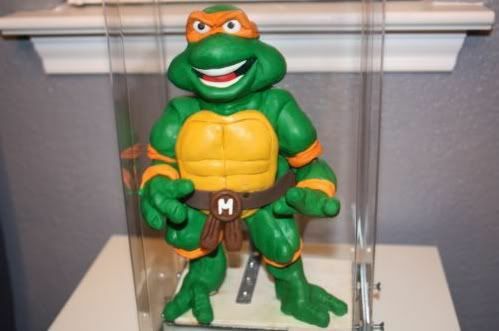 I can only tell you that the guy selling Mikey on eBay previously wanted 2,250$ for him. Also (if memory serves) i remember reading somewhere that Laird had couple of this set's (he gave one to his brother or something). Also Eastman had some. So it is possible that there are even more of this guys somewhere in the hands of private collectors. And i don't think that Mikey there is worth 1600$. They sold Raphael a while ago for 500$. Raph looks good, the colors are the coolest thing about these-in my opinion. I've learned that they are about 7 inches tall by 5 inches wide and that there are quite a few that were molded. With all that considered I think that 1600 is just too high a price tag for it, esp since its from a 20 year old commercial for a product that was ultimatley a failure- the pizza chowabungas. I would be a buyer around 4 -5 but certainly not more than that. Now for a movie head or costume I certainly would pay more than a premium price. I agree. Sadly there's only one costume in good shape (and that is Leo restored by Tom Spina) from movie 1 and it's in private hands. Others are splited in parts or destroyed completly or almost completly. Actually same story with costumes from other movies. There's not much of them. Everything either destroyed or scattered around US. Thankfully some of them are in museums where they should be safe for a long time. The only decent full sets I've seen are the Ralph one thats in IN the Leo one that you mentioned and another Leonardo one thats appearnetly in a Planet Hollywood in Myrtle Beach. Im sure one day a head will pop of for sale, but Ill bet its far between sales! 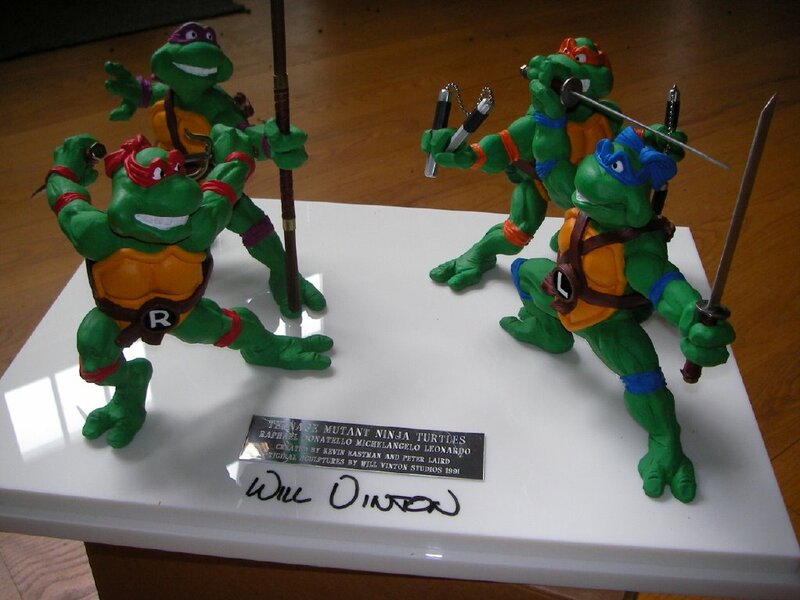 Has anyone on here contacted Jim Henson's Creature Studio's or someone like Tom Spina to commission a an exact replica of the movie turtles, or something directly from the original molds? Spina Design can make whatever you like. It's all about the price and this thing is individual for each project. I am not sure about TMNT copyrights do. And i wonder what would be a price for exact replica of movie costume. I contacted Spina a few years back since he restored the original movie 1 stunt Leo costume but he said he couldnt do it do to copyright issues. He was so strict he couldnt even give me info on material used for the real movie turtle or dimension. Tom is a super nice guy though and incredible at what he does . This is not exactly a prop, but I thought it may be of interested to a collector for say as it was used by a film crew member during Turtles II. I am always looking for Turtle movie props for my collection, but this is not right for me. I'm pretty sure that's a movie 1 jacket, not a movie 2 jacket. Those two particular pieces were sold as a set, many many times. They seem to trade hands once a year. Ah, I had misread your post. I thought you said rescued the PICTURES from obscurity, not pieces. Congrats on getting them. Nice to know they'll finally be appreciated. Where did you get that head?